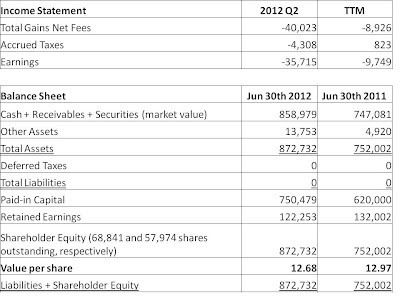 For the second quarter ended June 30th, 2012, KVF lost $0.52 per share, erasing a portion of the gains achieved in the first quarter. This decreased the value of each share to $12.68. This 3.9% quarterly decline in price falls between the S&P 500's decline of 3.3% and the S&P/TSX Composite's 6.4% decline in the same period. However, the results looked better than they actually were, as favourable currency movements increased the value of the portfolio by $0.18 per share. Either way, these results over such a short time period can show neither superior nor inferior risk-adjusted returns. The goal of this fund is to outperform over the long term; therefore, companies that are well-capitalized and that trade at low multiples to cash flows and/or assets will continue to be sought out. Many of the stocks held by the fund fell this quarter along with the market, though some fell more than others. A deteriorating financial position at one company in particular, Blonder-Tongue, resulted in the fund exiting its position at a loss. 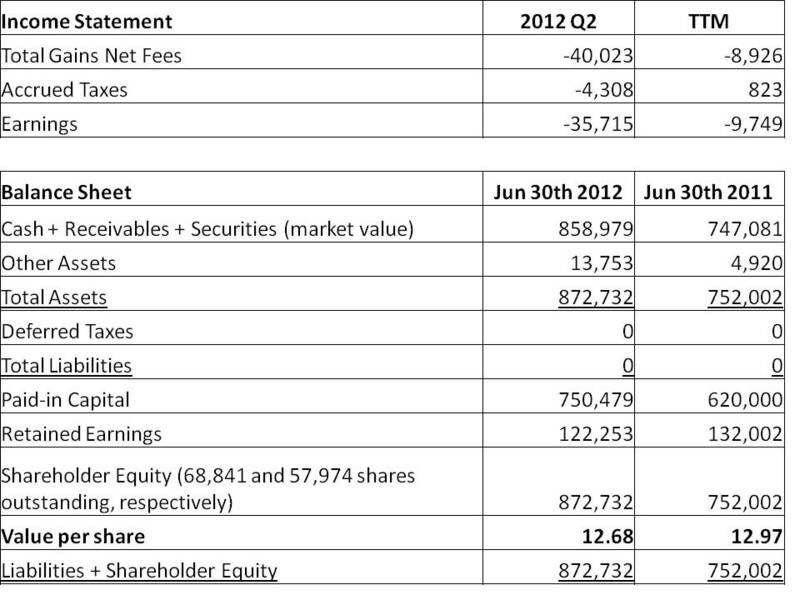 I believe I should have foreseen the trouble that would afflict this company's balance sheet, but I did not. You can read more about this mistake on my part here. Mitigating the losses this quarter were strong performances in the prices of Bassett Furniture, GTSI Corp and Paulson Capital (which can be read about here, here and here respectively). In this business, stability is impossible to achieve. Gains and losses can come in bunches. Thanks to shareholders for staying loyal through the ups and downs. What is your view on your fund performance over the years? Also, is all the fund money yours still? If in one quarter someone decides to invest money in your fund, how do you calculate the price they are charged, is it the current value that day of a share they are charged? I think my performance could be better. At the same time, however, the fund has been pummeled by a strong Canadian dollar and strong commodity prices (in which we don't participate) and that won't always be the case. Yeah the price is based on the market value of each share at the time of purchase.